The Tenba Roadie II Compact Photo/Laptop Case (Black) is designed to carry and protect a medium sized professional DSLR camera, HD video camcorder or medium format camera system. It also holds a laptop sleeve containing a computer with a screen up to 15” plus documents and accessories. Large D-SLR camera bodies with mid-range zoom lenses can be stored standing up; super telephoto lenses will fit with their hood and tripod collar in place. The case meets international airline carry-on standards and it even fits under many full-size airline seats. However, if one packs the case to the max, it may expand a bit beyond its 9" depth. It has a front briefcase compartment that holds cables, hard drives, documents, pens, keys and other accessories. 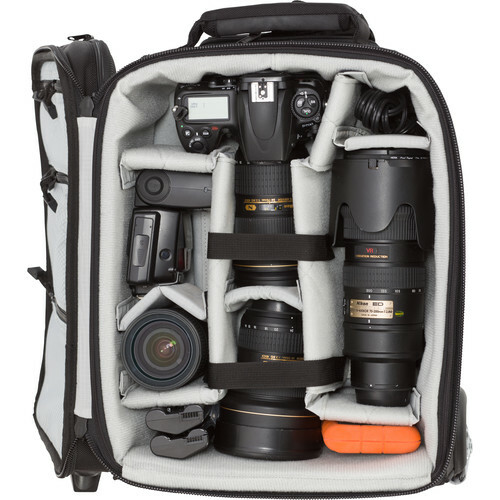 The photo section features fully adjustable/removable, padded dividers, and can be configured to accommodate a DSLR with mounted lens up to 300mm f/2.8. The Compact Roadie II has top access to the computer sleeve that can help speed through airport security. The quick-connect tripod carrying system will hold virtually any size tripod or light stand tight to the case for travel. A quick release tripod collar stows away in the rear pocket when not in use. There is an exterior front pocket that holds an included 4-pocket media wallet that fits either CF or SD cards, airline tickets, passport or other items. It has large, laminated mesh interior storage pockets for cables, filters, tools and other accessories. A rear pocket includes a steel-braided security cable that can be fed through the built-in, welded steel D-ring; wrapped around anything solid and stationary on location; and secured with an optional padlock. The Photo/Laptop case is made from weatherproof ballistic nylon exterior, with an EVA molded interior and a heavy-duty tricot interior. 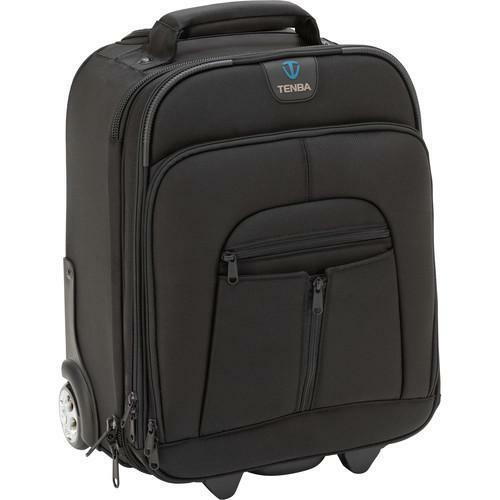 The case is transported by a padded, custom-sewn, massively reinforced handle, heavy-duty, five-section retractable tow handle and heavy-duty, ball bearing wheels. As a soft case, one may windup exceeding the 9.0" dimension if packed to the maximum.